Trust Local Wally to show you the best spas, resorts and luxury hotels in Napa's Yountville area. Updated photos, unbiased reviews and cheapest rates. Yountville is the ultimate Napa Valley hotel destination. It's a tiny town filled with luxurious resorts and Michelin star restaurants and plenty of wineries within walking distance. 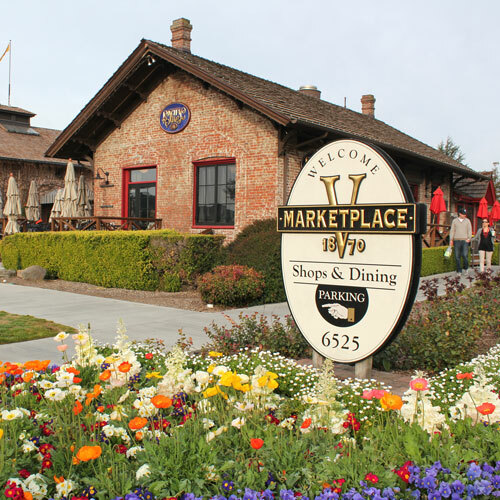 In fact, Yountville has so much to see and do that you might find yourself spending an entire day there shopping and tasting and taking in the natural beauty of the area. Hotel options in Yountville are on the upper end, luxurious and at times expensive. But you won't find a better destination for a romantic getaway, a perfect location for strolling the town in the morning with a cup of coffee and then walking to dinner at the end of the day. And don't forget to make your dinner reservations as soon as you book your hotel as every restaurant in Yountville books up fast. Check out the Yountville dining guide for my top picks! Short on time? Don't want to drink and drive but still want to pack maximum wine tasting into your day? Then walk the Mile of Wineries in Yountville, stopping at the dozen or more tasting rooms along the way. I've outlined the simple trek in my Walking and Tasting Agenda, the perfect way to spend a day or afternoon. Some of the wineries even offer discounts if you have a Wine Pass. Look, I know you've already heard me say this but the pass is the way to go since most wineries are charging $20 or more per person to taste. Click here for more info on how to get a pass. 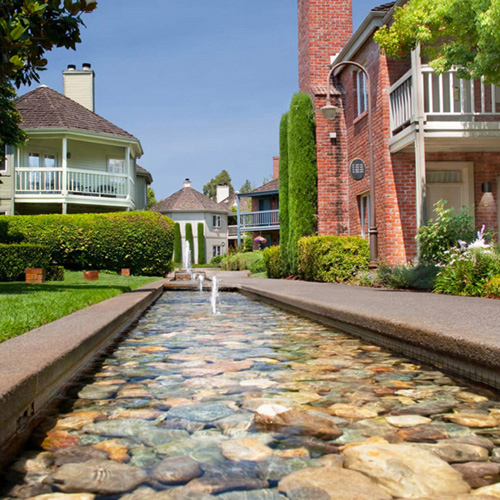 Villagio Inn and Spa has long been the ultimate destination when staying in Yountville. With its full spa, fireplaces in the room, spa bathrooms, and full resort style complimentary breakfast (with omelet guy and bottomless champagne) you'll be surrounded by luxury. Rooms are large and well appointed, the best ones are upstairs and away from the back where the noise from Highway 29 could be a problem for some. Huge whirlpool bath big enough for 2, maybe 3 if you are adventurous. Top pick, if you can't book here consider Vintage Inn, its sister resort Vintage Inn is next door that is quite similar is slightly less luxurious. LEED certified, eco-friendly, the only thing that is not sustainable will be your wallet as Bardessano is easily one of the most expensive places to stay in Yountville. That said, if your second car is a Tesla and you appreciate a hotel room that looks better than the HGTV dream house, Bardesso is for you. In-room spa services, a hip bar and restaurant that features produce grown in their own gardens, complimentary bicycles, yoga, even a shuttle to take you to the nearby restaurants and wineries. If budget allows, splurge on Bardessano and expect to be enveloped with luxury. Romantic, honeymoon approved. OK, so it's not exactly in the town of Yountville but close by, three secluded acres set alongside the Napa River. With only 12 suites, it's perfect for those wanting to escape the crowds and enjoy a private and exclusive getaway. Romantic? Why of course. Fireplaces, oversized whirlpool tubs with green tea bath salts surrounded by candles, gourmet breakfast served anywhere you want, complimentary afternoon wine, expect to be pampered. Rates are actually better than you might think, priced very similar to other resorts but offering a very different and upscale experience. A nice alternative to the mega resorts, escape to Milliken Creen Inn and Spa. This isn't my beautiful house. It's better! Looking more like a fully appointed upscale home than a hotel room, North Block Yountville is a chic and sophisticated alternative to the big resorts. Each of its 20 rooms are well appointed with keen attention to detail, from the mahogany front doors to the oversize soaking tubs to the luxurious thick wool carpeting. Expect the best, from heated floors to an inviting pool. Complimentary bicycles are electric powered, perfect for exploring the many nearby wineries and restaurants in Yountville. Top notch and no compromise, North Block Yountville is for those who appreciate the very best. Moderately priced hotel walking distance from the heart of Yountville. Huge rooms, fireplaces, good value. Above average hotel set right in the vineyards. Great pool, moderately priced, comp. breakfast, fireplaces. Excellent location, the sister resort to Villagio with similar amenities such as included breakfast, fireplaces, spa baths.